Thick, creamy cheesecake squares topped with a layer of tangy wine gelée. Irresistibly rich and perfect make-ahead dessert! Are you ready to wind down for the weekend with a glass of red (or white) tonight? It used to be my favorite way to end the day before I got knocked up. 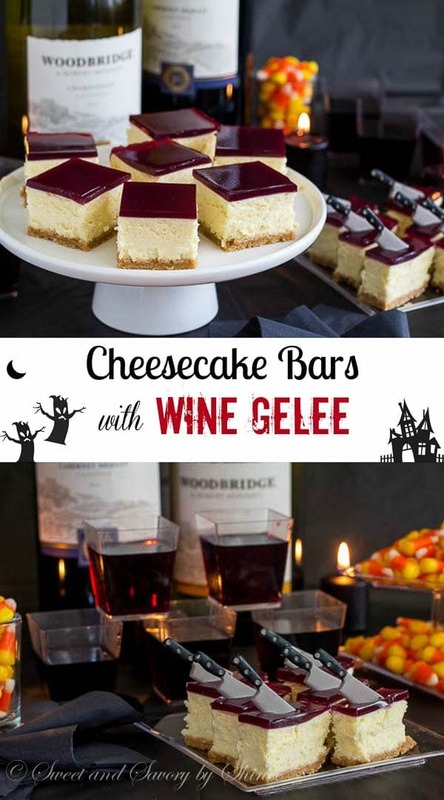 Now, I make a wine gelée to layer on my cheesecake to satisfy my cravings. 😉 And it totally works! Here’s a little backstory about how I got the idea for this recipe. A year or so ago, with two of my friends, we decided to try this cheesecake on Food & Wine, made with goat cheese and topped with wine gelée (don’t remember the exact recipe though). We all were intrigued, but unfortunately, it was a bust. We thought we liked goat cheese, but I guess not that much. And to the garbage it went. Sigh. I never let go of the idea of the wine gelée though. Hence, I decided to make my own version with the cheesecake filling I know I like. And I’ve got the winner on the second try. Yes!! 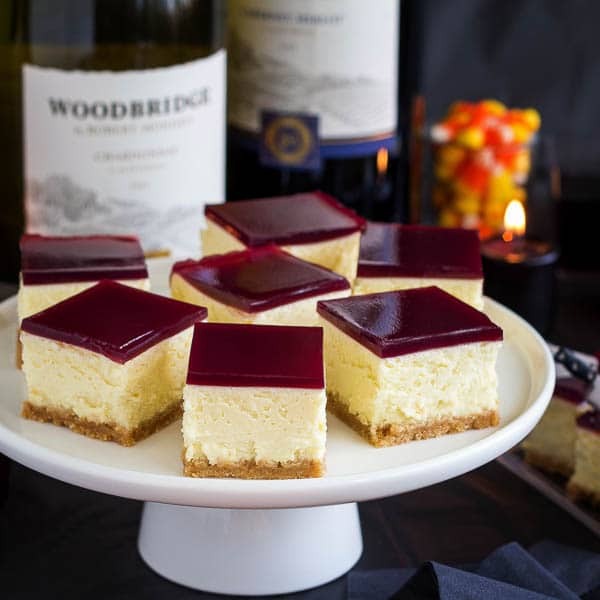 Wine gelée is tangy, not very sweet, but compliments sweet, creamy cheesecake filling beautifully. And how elegant are they? Admittedly, it does require a bit of time. Mostly hands-off time though, to chill and to set. So it makes a great make-ahead dessert. 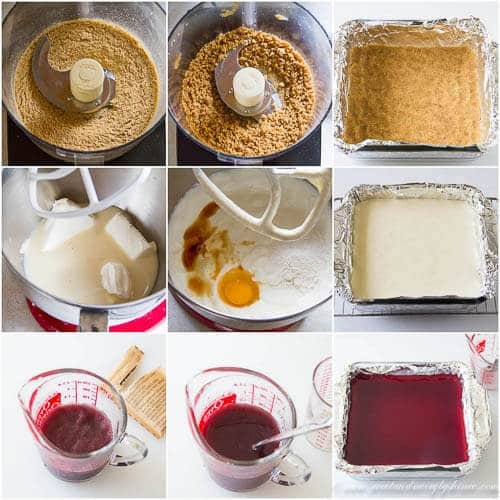 Just like in my lemon raspberry cheesecake bars (or this 3-ingredient souffle cheesecake), I’m using sweetened condensed milk as a sweetener for my cheesecake filling. It helps to create that irresistibly creamy texture. I love, love, love it! 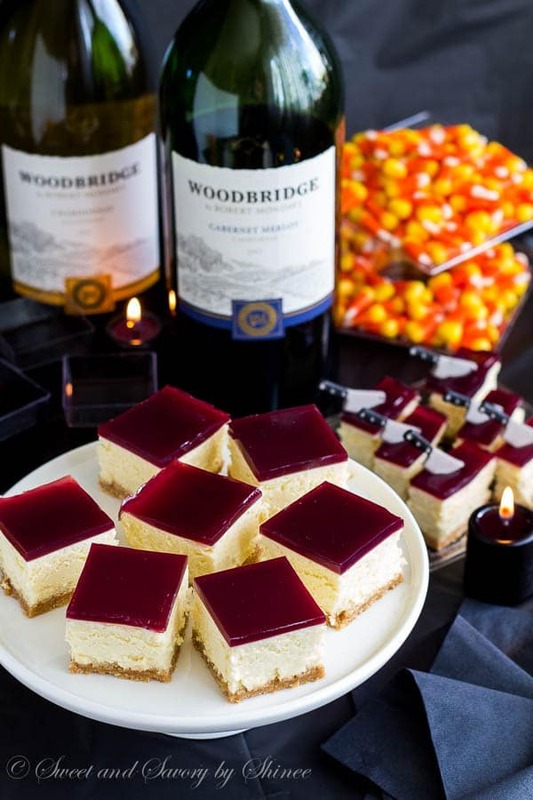 For wine gelée, I used Woodbridge Cabernet Sauvignon by Robert Mondavi (love his wines!). As mentioned above, wine gelée isn’t sweet, but if you prefer sweeter gelée, feel free to add more sugar. But I think it isn’t necessary, because cheesecake filling is plenty sweet. Quick tip: after you soak the gelatin powder in the wine, add hot sugar water and stir until gelatin is completely melted. At first, the mixture will look weird, lumpy and cloudy. But it’ll get nice and clear again (you might need to warm it up in the microwave for 30 seconds or so). 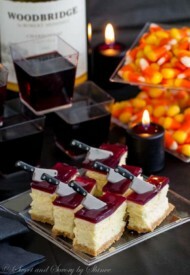 And use back of a spoon to gently pour the wine mixture over the cheesecake. Tell me what’s your favorite wine to enjoy? Red, white, sparkling, dry, sweet? Preheat the oven to 350°F (177°C). Line 8×8 square baking pan with aluminum foil, leaving two sides hanging over the edges. In a food processor, pulse the graham crackers into fine crumbs. (If you don’t have a food processor, place the graham crackers in a ziplock bag and roll a rolling pin over the graham crackers.) Add sugar and melted butter and pulse until the crumbs are evenly moistened with butter. Transfer the mixture into the prepared baking pan. Evenly spread it, lightly pressing into the pan. Bake for 10 minutes and cool on wire rack. In a large mixing bowl with whisk attachment, beat cream cheese, Greek yogurt and condensed milk until creamy, about 2 minutes. Add the egg, flour, vanilla extract and salt. Continue to whisk until well combined, about 2 minutes. Pour the cream cheese mixture over the crust. Bake it until the filling is set but not browned, for about 25 minutes. Cool the cheesecake to room temperature (about 2 hours), then refrigerate for at least 2 hours to chill. To make the wine gelée, sprinkle the gelatin over ½ cup of wine and let it sit for 5 minutes. Meanwhile, stir in the sugar in the hot water. Add the sugar water into the wine with gelatin. At this point, the mixture will be a little cloudy. Mix well until gelatin is completely melted. (If needed, microwave for 30 seconds to warm the mixture up. The mixture should become clear.) Add the remaining ¼ cup of wine and cool the mixture to room temperature, about 5 minutes. Gently pour the wine mixture using a back of the spoon over the cooled cheesecake. Refrigerate for at least 2 hours, or overnight, until the wine topping is set completely. Cut into 16 squares (or even smaller, if desired), before serving. This post was part of #FallMoments #WoodbridgeWines campaign. All opinions are mine alone.